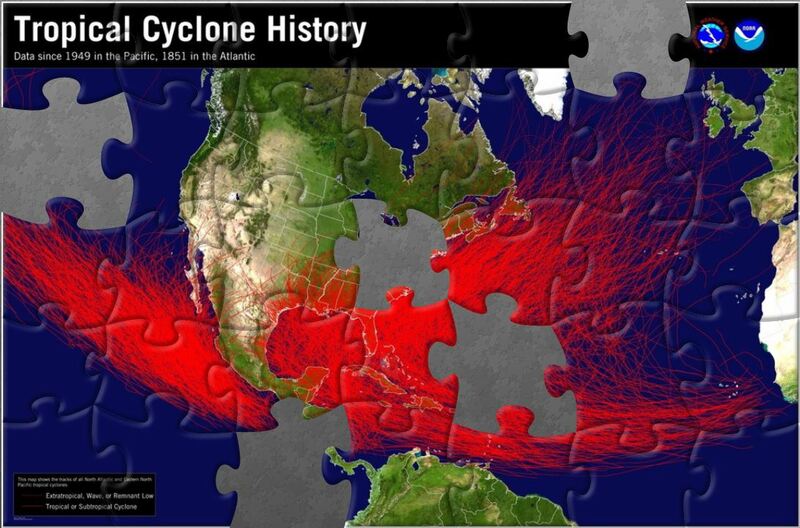 One of the lesser-known but important functions of the NHC is to maintain a historical hurricane database that supports a wide variety of uses in the research community, private sector, and the general public. This database, known as HURDAT (short for HURricane DATabase), documents the life cycle of each known tropical or subtropical cyclone. In the Atlantic basin, this dataset extends back to 1851; in the eastern North Pacific, the records start in 1949. The HURDAT includes 6-hourly estimates of position, intensity, cyclone type (i.e,, whether the system was tropical, subtropical, or extratropical), and in recent years also includes estimates of cyclone size. Currently, after each hurricane season ends, a post-analysis of the season’s cyclones is conducted by NHC, and the results are added to the database. The Atlantic dataset was created in the mid-1960s, originally in support of the space program to study the climatological impacts of tropical cyclones at Kennedy Space Center. It became obvious a couple of decades ago, however, that the HURDAT needed to be revised because it was incomplete, contained significant errors, or did not reflect the latest scientific understanding regarding the interpretation of past data. Charlie Neumann, a former NHC employee, documented many of these problems and obtained a grant to address them under a program eventually called the Atlantic Hurricane Database Re-analysis Project. Chris Landsea, then employed by the NOAA Hurricane Research Division (HRD) and now currently the Science and Operations Officer at the NHC, has served as the lead scientist and program manager of the Re-analysis Project since the late 1990s. In response to the re-analysis effort, NHC established the Best Track Change Committee (BTCC) in 1999 to review proposed changes to the HURDAT (whether originating from the Re-analysis Project or elsewhere) to ensure a scientifically sound tropical cyclone database. The committee currently consists of six NOAA scientists, four of whom work for the NHC and two who do not (currently, one is from HRD and the other is from the Weather Prediction Center). Over the past two decades, Landsea, researchers Andrew Hagen and Sandy Delgado, and some local meteorology students have systematically searched for and compiled any available data related to each known storm in past hurricane seasons. This compilation also includes systems not in the HURDAT that could potentially be classified as tropical cyclones. The data are carefully examined using standardized analysis techniques, and a best track is developed for each system, many of which would be different from the existing tracks in the original dataset. Typically, a season’s worth of proposed revised or new tracks is submitted for review by the BTCC. Fig. 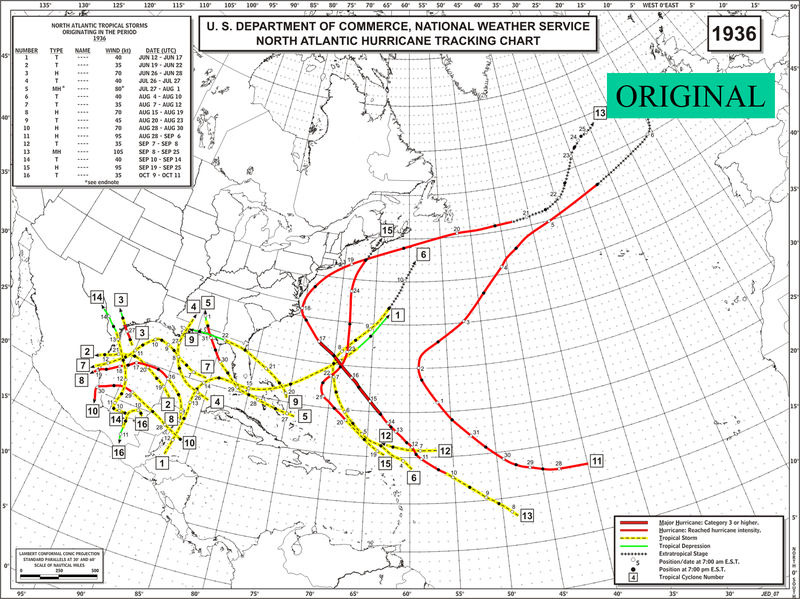 1 provides an example set of data that helped the BTCC identify a previously unknown tropical storm in 1955. Fig 1. Surface plot of data from 1200 UTC 26 Sep 1955, showing a previously unknown tropical storm. The BTCC members review the suggested changes submitted by the Re-analysis Project, noting areas of agreement and proposed changes requiring additional data or clarification. The committee chairman, Dr. Jack Beven, then assembles the comments into a formal reply from the BTCC to the Re-analysis Project. 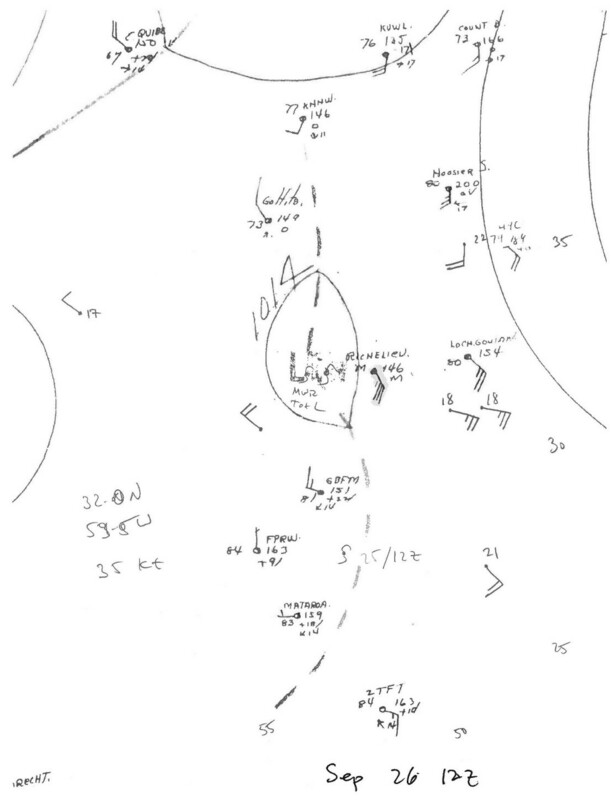 Occasionally, the committee’s analysis is presented along with any relevant documentation that would help Landsea and his group of re-analyzers account for the differing interpretation. The vast majority of the suggested changes to HURDAT are accepted by the BTCC. In cases where the proposed changes are not accepted, the BTCC and members of the Re-Analysis Project attempt to resolve any disagreements, with the BTCC having final say. In the early days of the Re-analysis Project, the amount of data available for any given tropical cyclone or even a single season was quite small, and so were the number of suggested changes. This allowed the re-analysis of HURDAT to progress relatively quickly. However, since the project has reached the aircraft reconnaissance era (post 1944), the amount of data and the corresponding complexity of the analyses have rapidly increased, which has slowed the project’s progress during the last couple of years. The BTCC’s approved changes have been significant. On average, the BTCC has approved the addition of one to two new storms per season. One of the most highly visible changes was made 14 years ago, when the committee approved Hurricane Andrew’s upgrade from a category 4 to a category 5 hurricane. This decision was made on the basis of (then) new research regarding the relationship between flight-level and surface winds from data gathered by reconnaissance aircraft using dropsondes. 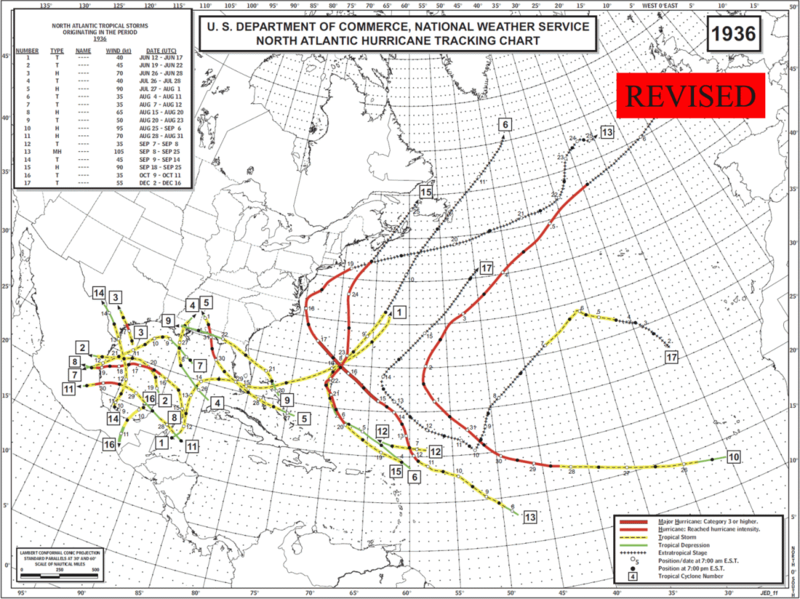 The figures below show the revisions made to the best tracks of the 1936 hurricane season, and give a flavor of the type, significance, and number of changes being made as part of the re-analysis. More recent results from the BTCC include the re-analysis of the New England 1938 hurricane, which reaffirmed its major hurricane status in New England from a careful analysis of surface observations. Hurricane Diane in 1955, which brought tremendous destruction to parts of the Mid-Atlantic states due to its flooding rains, was judged to be a tropical storm at landfall after re-analysis. Also of note is the re-analysis of Hurricane Camille in 1969, one of three category 5 hurricanes to have struck the United States in the historical record. The re-analysis confirmed that Camille was indeed a category 5 hurricane, but revealed fluctuations in its intensity prior to its landfall in Mississippi that were not previously documented. The most recent activity of the BTCC was an examination of the landfall of the Great Manzanillo Hurricane of 1959. It was originally designated as a category 5 hurricane landfall in HURDAT and was the strongest landfalling hurricane on record for the Pacific coast of Mexico. A re-analysis of ship and previously undiscovered land data, however, revealed that the landfall intensity was significantly lower (140 mph). Thus, 2015’s Hurricane Patricia is now the strongest landfalling hurricane on record for the Pacific coast of Mexico, with an intensity of 150 mph. The BTCC is currently examining data from the late 1950s and hopes to have the 1956-1960 re-analysis released before next hurricane season. This analysis will include fresh looks at Hurricane Audrey in 1957 and Hurricane Donna in 1960, both of which were classified as category 4 hurricane landfalls in the United States. As the re-analysis progresses into the 1960s, the committee will be tackling the tricky issue of how to incorporate satellite images into the re-analysis, including satellite imagery’s irregular frequency and quality during that decade. The long-term plan is to extend the re-analysis until about the year 2000, when current operational practices for estimating tropical cyclone intensity became established using GPS dropsonde data and flight-level wind reduction techniques. This entry was posted in NHC, re-analysis and tagged best track, HURDAT, Patricia, re-analysis.